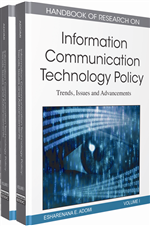 This chapter provides an evaluation of ICT policy developments in Botswana. In particular, it highlights major advancements in areas of national ICT policy development and its implementation in the country. The country’s National ICT policy, Maitlamo, has been a significant factor in driving ICTs in the country. The chapter asserts that opportunities in ICT development in the country are evidenced by not only implementation of the policy but further by greater investment of financial resources by the government and the role of the private sector. Further, the chapter argues that while implementation of the national ICT policy has brought achievements in liberalisation and expansion of public services in rural areas, there are still a number of challenges to address if universal access has to be achieved. Among these are unavailability of ICT services in rural areas, high costs of the technology and the lack of public awareness on the use of technology. Proposals made at the end of the chapter call for the government to speed implementation of ICT policy, form stronger partnerships with the public sector and further balance the role of BTC vis a vis other players so that the playing field is leveled. The embracing of information communication technologies (ICTs) in world economies has greatly enhanced production, and easy accessibility to public services. ICTs have been broadly defined in the literature as the technologies that are used for capturing, creating, accessing, manipulating, presenting, communicating and transferring information and knowledge (Tiamiyu & Aina, 2008). Examples of these can include equipment such as hardware (computers), software applications as Internet and networking infrastructure. With the help of ICTs, organisations are now able to create and store large amounts of information and can also have quick access to it, therefore promoting efficient, evidence-based decision making. Further, it also contributes to knowledge sharing by putting in the public domains research outcomes. Without doubt these technologies have improved service delivery and have been important in opening up opportunities for socio-economic development (Mutula & Brakel, 2006). For example, ICTs have played a major role in economic growth which has been realised through foreign direct investment; it has lead to poverty reduction and employment creation. ICTs also facilitate access to public services such as education, health and banking. Further, with the realisation of e-government strategies in many African countries, ICTs play a central role in facilitating the interaction of government and the ordinary citizens. However, this can only be realised if the infrastructure is available, affordable, fully accessible to the public and there is an enabling environment, proper regulatory frameworks and multi-stakeholder partnership. Unreliable infrastructure is leads to high costs due to high transaction costs (Gerster Consulting, 2008). While use of ICT has occasioned many benefits, it has also brought about problems that have to be addressed if its full potential and value has to be realised. For example, dependence of computers on power supplies which is becoming a major problem in most countries including Botswana has affected some business operations when there are power cuts and load shading. Technology also has a short life-cycle which is costly to update which means that when its life comes to an end new technology is needed and this comes at a high cost. For example, Microsoft Patch Security Management System (MPSMS) is a Windows security update system which makes sure that Microsoft operating software programs remains up-to-date with contemporary security threats. The short life cycle also results in data loss where migration of data from one software to another has to be done after upgrading. Another problem that has to be addressed if full potential of ICT were to be realised is its over-dependence on the internet. For Botswana, and many other African states, Internet Service Providers (ISP) charge exorbitant rates for internet service provision. There is also an issue of expensive prices in acquiring basic end-user gadgets such as printers, desktop computers, scanners, network adaptors, etc. Another challenge that cannot be ignored is usability. With the setting up of Trans Kgalagadi Fibre optic network in 2008, setting up of appropriate telecommunications infrastructure by Botswana Telecommunications Company (BTC), liberalisations of the telecommunications sector, and plans to put in place efficient backbone infrastructures in Botswana, it is assumed that by 2016, there will be widespread accessibility of all forms even in the rural areas. This being the case, one has to ask, will the ordinary citizenry be informed enough to take advantage of the ICTs and therefore extract maximum or any appreciable value brought about by such developments? This chapter is timely as it endeavours to investigate whether the ICT policy evolution and developments in Botswana have delved towards addressing these challenges. Botswana: (Tswana: Lefatshe la Botswana) is a landlocked country in Southern Africa. Citizens of Botswana are called “Batswana” (singular: Motswana), regardless of ethnicity. Formerly a British protectorate of Bechuanaland, Botswana adopted its new name after becoming independent within the Commonwealth on 30 September 1966. It is bordered by South Africa to the south and southeast, Namibia to the west and north, and Zimbabwe to the northeast. It meets Zambia at a single point. African Information Society Initiative (AISI): A society for African countries whose vision is to bridge the digital divide. Universal Access: A phenomenon which outlines the goal to have more people have access to and utilise information communication technologies. ICT Policy: A set of pre-defined actions with a view to encouraging the use of ICT in every socio-economic endeavours. A policy is typically described as a deliberate plan of action to guide decisions and achieve rational outcome(s). However, the term may also be used to denote what is actually done, even though it is unplanned. Botswana Telecommunications Company (BTC): A telecommunications company that enjoyed monopoly of telecommunications service provision in Botswana for a long time before liberalization of the ICT market. Botswana Telecommunications Authority (BTA): Independent regulator of the telecommunications sector in Botswana. Ministry of Communications, Science and Technology (MCST): A government ministry charged with implementing and coordinating the development of ICT in Botswana. Information Communications Technologies (ICT): An umbrella term that covers all advanced technologies in manipulating and communicating information. The term is sometimes used in preference to Information Technology (IT), particularly on these two communities: education and government. IT or ICT encompasses all mediums, to record information (magnetic disk/tape, optical disks (CD/DVD), flash memory etc. and arguably also paper records); technology for broadcasting information - radio, television; and technology for communicating through voice and sound or images - microphone, camera, loudspeaker, telephone to cellular phones. It includes the wide varieties of computing hardware (PCs, servers, mainframes, networked storage). Rapidly it develops personal hardware market the comprise mobile phones, personal devices, (MP3, MP4, MP5 and MP6) players, and so much more. (Wikipedia, 2009). Maitlamo: The latest national ICT policy that is being referenced in implementing the ICT development roadmap in Botswana.